Holy cow! The three issues we looked at last week were phenomenal, and it'll be difficult to meet or surpass the events of issue #28, but don't worry, denizens. We are at the halfway point in the first The Micronauts volume, and I will spoil that more awesomeness on par with issues 11 and 28 are on the horizon. But, there's some story building to be done, and Mantlo and Broderick do not waste any time getting the next big thing moving, and neither should we. 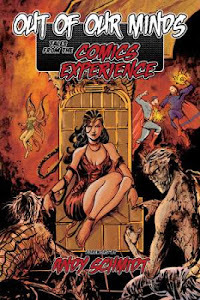 We're only going to look at two issues today, as I close out the first volume (30 issues) of the library bound omnibus I had made a few years back...so, let's get to it. 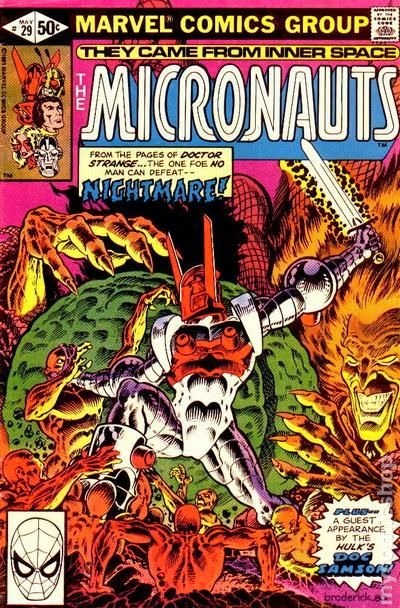 The Micronauts #29 - Written by Bill Mantlo, illustrated by Pat Broderick, inked by Danny Bulanadi, lettered by Joe Rosen, colored by Doc Martin, edited by Louise Jones, published by Marvel Comics. The battle has ended. Baron Karza has been defeated...but at great cost. Biotron is dead, Queen Esmera of Kaliklak is dead, the traitorous Acroyear Prince Shaitan is dead, and the World mind, the very soul of the Acroyear world Spartak, has also perished after giving King Acroyear the necessary power to destroy Karza once and for all. Not only that, Commander Rann is in a psychic coma after Karza ripped the power of the Enigma Force from his mind and had the psychic ties he implanted ripped apart when Acroyear brought down the tyrant. It is now a time to pay respects to the fallen—both Earth and Microverse soldiers—as Colonel Nick Fury recounts the terrible battle. The repercussions are not over, as Cilicia learns that her husband's victory was won at the cost of her home planet, and that her people are now forced to wander the stars; she calls him a traitor and walks out on him and the Micronauts. As all seems lost, Doc Samson arrives to check on Rann, and finds that the trauma to the Commander's brain can be fixed, but there is also a mysterious presence in his brain that will need to be dealt with first. Samson shrinks Mari, Bug and Acroyear down and blasts them into the Commander's head, where they will attempt to reunite the left and right halves of their leader's brain, while attempting to defeat the threat of...Nightmare. Young Donist - Words. Lots and lots of words and talk about brainly stuffs. What does it all mean? Is my brain built like the Commander's and am I at risk of having my left and right halves separated? Is this something I should be worrying about? What is the meaning of life? 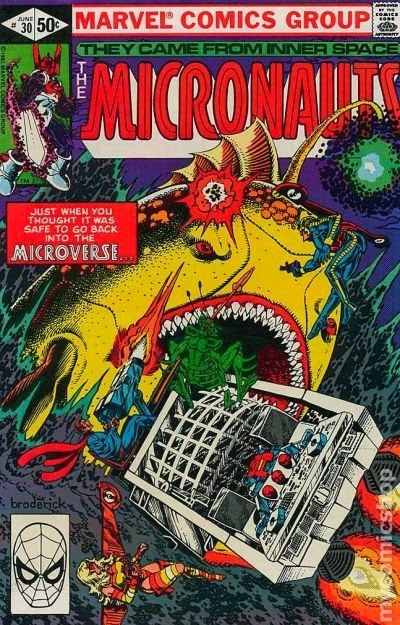 If the Microverse is the size of a molecule, could a Microverse exist within my own head? Uhhhhhh...I'm freaking my young self out. Let's just focus on how cool Bug and Acoyear are and how sad we are that Cilicia is out the door. I was really bummed to see Cilicia leave, as she was a mighty addition to the team. I understood why she was upset with her husband, but how could she not understand that her planet willingly sacrificed itself for the good of not just the Acroyear people, but for the entire Microverse as well as the strangers of Earth. Ugh...yet another step in the march that is tragedy. I had to shake off this bit as well. I loved the panel of Samson—who I knew very little about—using the massive ray gun thing to blast the Micronauts into Rann's head, but the page 14 mostly-splash page with Bug in the foreground blew my mind with the level of Broderick's detail. I had no idea who this Nightmare cat was and it would be two years later with the release of the The Official Handbook of the Marvel Universe for me to find out, but I will say that I thought he was awesome looking. The idea of physically battling your nightmares blew me away, and I was thankful for the scenes of the Commander waking from his coma, and for Microtron dealing with the traitorous a_hole who had been lurking in their midst. I liked what I read, but it's safe to say that the themes and ideas of this issue kind of messed me up for the rest of the month until the next release. RECOMMENDED! Current Donist - I read this as a 10 or 11 year old? Huh, I guess that explains a lot about Current Donist—best not to overthink it. 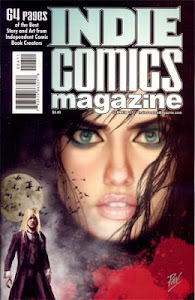 Before I even crack the issue open, the impressive Broderick cover stands out in its design and the psychedelic colors. Acroyear is the only normally colored character, which propels him from the page, and the near-complementary color schemes of the green brain and the red background with the orangish-yellow Nightmare make this a striking image. 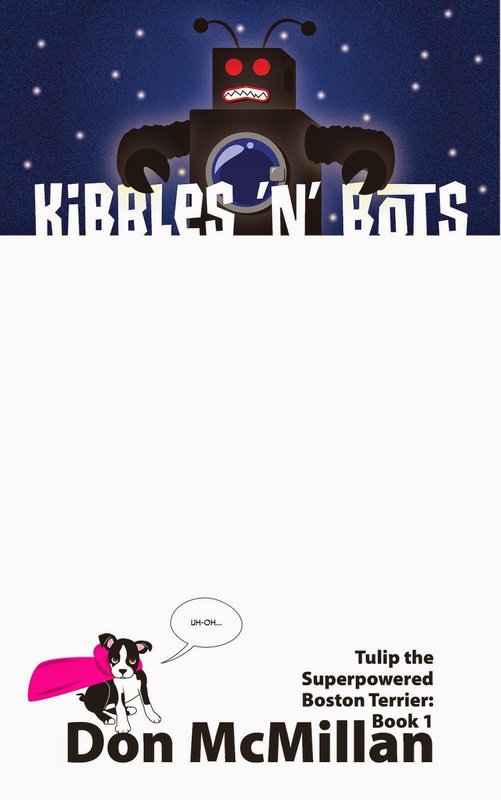 I am still digging the captions on the cover...ahhhh, nostalgia. Opening the book and reading through, there is quite a bit of exposition to bring readers up to speed, which makes this book a decent jumping on point, but I would still strongly recommend starting from the beginning over jumping in here. But although the exposition gets a bit heavy, and the subject matter dealing with the intricacies of the brain—man, how ever did Mantlo research this without the internet and Wikipedia?!? !—were a bit much for Young Donist, I found them...still kind of out there, but I was at least able to follow. Cilicia's reaction, when it finally sinks in what happened to her planet and people, is rough (final panel on page 6), and Broderick brings that pain and shock across tremendously. The rest of the book is somewhat different from what has come before. It's weirder, darker, almost like a Warren Magazine tale, only set with established characters dealing with the horrors of the mind. Bug, Acroyear and Nightmare all look fantastic, and Martin's colors throughout this issue, especially in the Nightware world, add to the mood. Even though I didn't quite understand what the heck was going on as a kid, I did revisit this issue often to see Broderick's gorgeously insane pages. Now as an adult, I understand much more and appreciate the crazy research Mantlo must have done for this issue. Knowing what is to come, I will spoil that although you will see a couple guest appearances pop up, the series will continue its journey into the bizarre and the weird, successfully embracing more of the Warren Magazine and Pacific Comics strange science themes as it builds to its next big storyline. *Side note...I wish, wish, wish I owned page 14 with Bug, Acroyear and Mari plummeting into Rann's mind. HIGHLY RECOMMENDED! The Micronauts #30 - Written by Bill Mantlo, illustrated by Pat Broderick, inked by Danny Bulanadi, lettered by Shelly Leferman, colored by ?, edited by Louise Jones, published by Marvel Comics. Oops on crediting the colorist...The new storyline of the search for the Enigma Force begins here! Commander Rann is back, and he knows what he must do. Before awakening from his coma, Rann saw the image of a Obelisk foretelling the coming of a "time of darkness" and of three keys that will call forth the Enigma Force once again to protect the Microverse. As the Micronauts, Prince Argon, Slug and Prince Pharoid discuss the foretelling of the obelisk, a massive earthquake hits Homeworld and the quest for the three keys to the Enigma Force begins. Unfortunately, the Micronauts will be without Acroyear, who must head out to his former home planet, that is now a lifeless rock, to begin his search for his people; the message left for him will wound him to the fiber of his being. The rest of the Micronauts, now with Pharoid as a temporary member, are off to Oceania to find the first of the keys. Young Donist - Sweet! Back in the Microverse, and not only that, we are going to get to see much more of Homeworld as revealed on the "Tales of the Microverse" map from issue 24. Karza might be gone, but the Micronauts have a quest to find three golden keys to prevent a new threat, and I couldn't have been happier. I will admit to being a bit confused as to where Oceania and Seazone are located in relation to each other, but I decided to just go with the flow. I smiled seeing that Microtron was looking to get a "girlfriend" with Nanotron, but I was pissed about Acroyear's people leaving him that mean message on the dead Spartak. Don't they know he had no freakin' choice but to harness the power of the Worldmind?! Man, the guy saved two universes, maybe layoff the emotional abuse and guilt for a while...would it kill them to, I don't know, say thank you? Acroyear saved your collective asses and this is how you thank him? <sigh> Anyhow, I was excited to see Pharoid join the team, and the fight with the Leviathan creature was cool, as was the reveal of Aquon, lord of Oceania. Also, Lady Coral...she's very pretty. I remember spending a lot of time wondering what it would be like to live in the majestic Seazone. How cool would it be to step out your bedroom and dive into the ocean? Whoa! Dr. Strange is going to be in The Micronauts?! HIGHLY RECOMMENDED! Current Donist - First thing's first...credit everyone involved, for cripe's sake. I have a strong suspicion the art boards did not color themselves. <sigh> Okay, storywise I really dig the promise of the quest for the keys, the portent of doom and destruction, the search for the Enigma Force, and most of all getting to explore the many regions of Homeworld. Now that I have read this issue as an adult, I realize that Oceania is one of the spheres of Homeworld, and that Seazone is massive city floating atop Oceana's waves. I also have a better understanding of why Cilicia and the Acroyear race are kind of hacked off at Acroyear. Dude killed their world, even though it was Spartak's will, but I'm assuming his people were left wondering if maybe there was another way. I'm still with Acroyear on his decision—you had to be there, Acroyear peoples—but I would be pissed, too. With Karza defeated—or is he? mwa ha ha ha!—I love Mantlo's mysterious new threat, and the hero's quest before us has me interested. Broderick's storytelling on this issue is fantastic through both the dramatic scenes (poor Acroyear, denizens) and the fight with the Leviathan. The costuming of the Seazone inhabitants is cool, especially Lady Coral's crazy outfit—does she shop at the same store as Plant-Man and the Molecule Man? Broderick's character design of the orange merman, Aquon, is also fantastic, but I am left with a question...Do all sea-dwelling Marvel Universe characters have severe eyebrows? Hey, I'm not judging or anything, but Lady Coral, Aquon, Ryak, all have those Namor the Submariner upside-down "V" eyebrows? If so, there's this gal at the salon downtown who'd be dynamite at rounding those puppies out...I'm just sayin'. Anyhow, Lady Coral...she's very pretty. All of that said, I had forgotten that Dr. Strange plays a major role leading up to the coming big events that culminate in issue #35, one that you can add to the list of all-time-great The Micronauts stories. This new storyline is in its infancy, but I am completely on board and excited to see what happens next. HIGHLY RECOMMENDED! Remember last week how I mentioned that there are still more incredible issues coming for these first 59 comics? Well, issue 35, if memory serves, falls in line with issue 11 and 28. The quest to find the Enigma Force is on, and we will see new members joining the team as we explore the outer reaches of Homeworld and the weird things and people who dwell there. With Dr. Strange holding a major part in what is coming, I would generally be wary, but with Strange comes the bizarre and the creepy, which is right up my alley. I can't wait to re-experience how this storyline plays out. Thank you for reading. While writing this entry, I listened to a Spotify recommendation of "Ghibli Jazz" by All That Jazz. Now it looks like I need to revisit some Hayao Miyazaki films...maybe Nausicaa of the Valley of the Wind. Check out the album if you have a moment and definitely check out what are some of the most beautiful films ever made.